Earlier this northern summer I had an overnight stopover in Denmark’s capital, to break up the train journey from Switzerland to Norway, and was overwhelmed by its bike-friendliness. I mean, everyone knows this is THE bike city, but I hadn't realised just how bike-centric it is until I spent 24 hours there. In Copenhagen, it’s easy to believe we became bipedal to, er, pedal, not walk upright. Everyone rides bikes in the Danish capital, which has a whopping 400km of bike lanes. I saw people of all ages on bicycles of all shapes and sizes (parents on "pram" bikes, removalists on "cargo" bikes), girls in skirts with their cardigan wings flapping, shirtless young men (long live summer), businessfolk in suits (more than half of all Copenhageners commute to work by bike). Princess Mary probably has a royal bike. It's hard to imagine why we ever drove cars, in such a bike utopia. There are bike-only bridges. Bike parking stations. Double-decker bike racks. Garbage bins angled towards cyclists so they can toss things in as they ride by (how cool is that?). Green LEDs on bike paths that light up when you ride at 20kph, fast enough to make all the green (bike) traffic lights. As in other European cities, there's a bike-share scheme, of course, but Copenhagen's (called Bycyklen) has 2000 (!) electric "smart bikes" with GPS units, built-in lights and puncture-free tyres (and the cost is a very tourist-friendly 25 kroner, of $4, an hour). This is one cool, two-wheeled city. Here's a neat video clip from Treehugger.com about Copenhagen's bike-friendly present and future. 1. 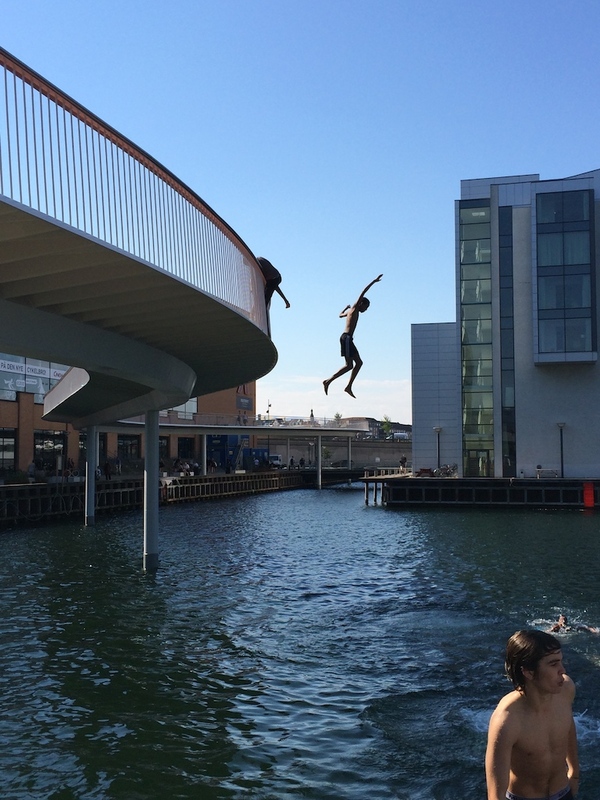 You can swim in the harbour – I saw this in Oslo, too, people getting their annual dose of vitamin D right in the heart of the city, on open patches of grass, on jetties, and just diving into the harbour (or the free harbour pool) to cool off. I would have joined them if I hadn’t left my swimmers in my luggage in a locker at the station (epic fail), but I did swim in Oslo (twice!) and the water was surprisingly warm. 2. It has Europe’s largest hostel, Copenhagen City Hostel, a 5-star, 14-storey design hostel in a harbourside building (the tallest in Denmark until 1958) on Hans Christian Anderson Boulevard (where else?). I slept in one of its 1020 beds, on the 11th floor and had a great view over the city for about $49 (265 kroner; Copenhagen may be bike-friendly but it ain't cheap). 3. You can juice birch trees here – well, not personally, but in Copenhagen you can buy SealandBirk organic birch tree juice. Tastes sweet, and is full of antioxidants and vitamins, apparently. 4. It has virtual tourist information booths. The tourism information centre was trialling these at Copenhagen’s central station when I was there in July. Needing a city map, I walked in, pressed the touchscreen and skyped with a friendly, real person in the tourist info centre a few blocks away. 5. Is it just me or do Danish people, on the whole, look incredibly healthy? Everyone I saw was rosy-cheeked, sparkly-eyed, shiny-haired. Maybe it's because they ride bikes everywhere. And I thought Panama City had some great cycling ideas - wow! Thanks Lou, loved this blog. I just traded my Airnimal folding touring bike for a french made Lapierre Passport Folding mountain bike so I an go more places on my sailing trip. Bikes are the way to go! Talking about security, any motorbike that is certainly transported through the rear will not really end up being ruined once the driver does not remember this motorbike is usually on the roof as well as hard drives in to a small threshold storage area, for more information click here the bike rack guide. Thanks for the update! Just reinforces the fact that Denmark, and Europe in general, is so far ahead of Australia in terms of bike usage and rental. In Melbourne a bike rental scheme was recently axed because of vandalism: people were throwing rental bikes in the river and anywhere else they could, so disappointing.